Trimax has developed a unique concept with the 1080 that surpass the capabilities of existing trimarans. It is distinguished by both the interior and exterior design and by applied materials and techniques. There were no concessions, neither on sail technical field or on the interior finishing and certainly not on the quality and safety. Safety, buoyancy & stability is guaranteed by optimal design of the main hull and floats, which was tested in the towing tank of Southampton (home of many wedstrijdtri’s).The result is a hull with a small wet surface at light wind conditions and yet sufficient area at more wind speed. The floats are the same length as the main hull and bulkywith a lot of volume in the front, so that at higher speeds sufficient lift to the bow will becreated (of boththe hull and of the floats) to slide over the water. As a result, there is hardly any risk of tunneling into the waves orcapsize. The large volume of the floats ensures that the Trimax, even with a hole in themain hull, remains seaworthy and controllable. With a volume of 3.3 m³ one float is sufficientto bear the entire ship (boat weight ± 2.800 kg). The trampolines are made from a PVC-coated (UV resistant) anti-slip cloth, have a highdegree of perforation so that any overtopping waves will immediately be drained. The Trimax is one of the only trimarans equipped with a gunwale, so that the deck and the mast always remain safe accessible. The forces on a trimaran are to nine times (!) larger than those on a comparable monohull. Therefore, a trimaran needs to be much stronger built. The construction of the hull and floats of the Trimax is extralight, strong and stiff, developed after an extensive three-dimensional strength calculation.The skin of the full Trimax consists of a sandwich construction with an outerand inner sheath of epoxy resin and carbon and a core ofat least 15mm hard foam. Moreover, the interior is largely made of laminatedsandwich foam and laminated to the skin, reinforcing the stifness. The beams, daggerboards and rudder are reinforced with carbon fibers. The specific gravity of the sandwich construction is significantly lower than that of water, so that the Trimax has much buoyancy. Watertight compartments in the front and rear of hull and floats ensure extra buoyancy. The beams are mounted extra high, so that a rough sea does not get a grip onthe boat. All these properties makes the Trimax 1080 a perfect seaworthyyacht with great stability! With the retractable daggerboards and folding rudder, the Trimax 1080 has a draft of 50 cm, so beaches, shallow water and other normally inaccessible places, become perfectly accessible. The bottom features a sturdy laminate and the daggerboards and the rudder automatically fold in when running aground. An ingenious folding system prevents costly berth in ports. The folding is easy and done by vertically folding the floats to the side of the hull. This folding system allows a wider hull than those of comparable trimarans so creates a more spacious interior. The system is a further development of the ‘Farrier’ folding system (which only has one folding position), ocean seaworthyness is proven in many transats. The width of the trimaran measures 8m50 unfolded and 3m80 folded in in the harbor, so he fits perfectly in a “monohull” berth. The low center of gravity and the width of 3m80 garantees sufficiently stability in the port itself as ‘outside’ a storm occurs. By the ability to trailer the Trimax meets the need for both short term (eg racing or short breaks) and for longer trips or to explore other areas ore to increase your own sailing area. 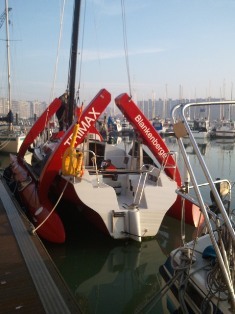 The Trimax 1080 is the largest trimaran which can be trailered. The optimized shape of hull, floats, beams and daggerboards, the light hull construction and large stability not only give a strong sense of security. Together with an expanded battened mainsail and a long retractable carbon bowsprit which fits an extensive sail wardrobes, they guarantee excellent sailing characteristics. With the accelerations, the sailor enjoys the thrill of a fast open boat. 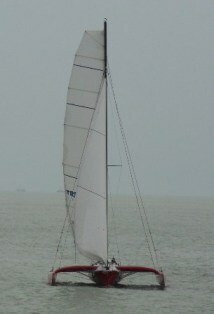 Deck plan and sail plan are designed to sail single handed or with complete crew. The spacious cockpit, the large outer space due the trampolines and a maximum gradient of 10 °, make sailing more comfortable, even with heavier weather. Thanks to its high stability the Trimax does not need to reef quickly. Nonetheless, the mainsail has three positions for reefing so that even in extreme weather can be sailed safely.